With a love of tackling the string quartet canon and as fierce a passion for discovering newly composed works, Amaranth Quartet was founded in 2014 and proudly calls the San Francisco Bay Area home. Members Emily Botel, Abigail Shiman, Julie Michael, and Helen Newby strive to present classical music to divergent audiences in a variety of locales. Mentored by the Kronos and JACK Quartets, they have received additional guidance from members of the Cypress, Ives, Pacifica, Brentano, Concord, and St. Lawrence String Quartets. This concert is $30-50 Sliding Scale Admission/$15 Students & Seniors and includes refreshments. Exciting projects this season include appearances on the Kronos Quartet Festival, The Presidio Sessions Series, San Carlos Eclectic Music Festival, Bay Area Modern Music Festival, and Old First Concerts. Residencies last summer included The Banff Centre, New Music on the Point, Avaloch Farm, and Lake Tahoe Summer Music Festival. Amaranth Quartet firmly believes in the importance of community engagement. They are actively involved in and committed to outreach at grade schools across the United States. 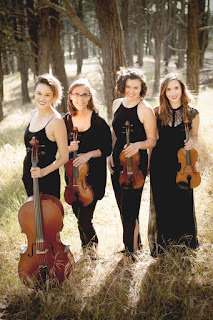 The Quartet was in residence at Palo Alto Chamber Orchestra’s Summer Chamber Intensive in the summer of 2016, and has planned outreach tours to school districts in Truckee, CA in the spring of 2018.